Hurry before it’s too late! … BUY NOW! Can you provide some examples of these templates? 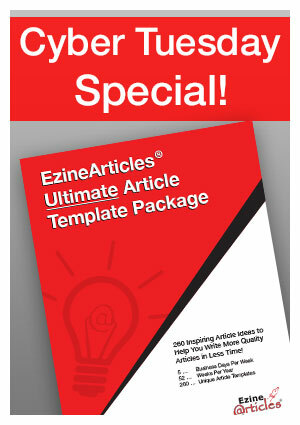 Wow, it great offer by EzineArticles for professional content writers. Looks like impressive and useful Article Templates. Can you show an example of a writing template? Thanks for your question! An article template is a detailed writing prompt that leads writers to new ideas while helping them follow an outline to ensure a well-structured article. Our Unique Article Template Package has 260 unique writing templates! Each template provides an inspiring, NEW angle of writing about your niche. Can we get a list of those article titles? how long this offer will last? how much a single article cost? where I can buy only the titles I need? sorry too many questions! How long will this introductory special last? This Friday at Noon Chicago-time, price goes up to retail. I’m not sure if we are going to bundle the 10+ hours of the AudioBook version that we are in production of right now as a bonus for those who are the first to own this product this week, but the intro special ends this Friday. Just to be clear, this new *Ultimate Article Template Package* is a tool, a guide and it contains the best templates we’ve written over the past years plus several dozen new templates and then we spent weeks & weeks writing and re-writing — improving our article template advice/suggestions… all designed to help *YOU* get your expertise out of your brain and into high quality articles (and FASTER) that you can use to help grow your business. Someone asked us privately earlier today if we are selling articles. The answer is no. We are not selling articles. If you were looking to purchase pre-written articles, sorry…this is not that product and we do not sell articles. It is the little changss that will make thee greatest changes. That’s really better package people love that and you know that is very helpful to for users of Ezine.